Save up to 80 litres of fuel1. MICHELIN ENERGY™ Saver lasts 6,000 miles longer2. Longer-lasting tyres also result in fewer worn tyres to recycle! Your safety is always a priority for MICHELIN. Your braking distance is up to 3 metres shorter on wet roads3. 1 Estimate of average saving with Michelin ENERGY™ Saver tyres for petrol vehicles compared to its main European competitors. Rolling resistance tests carried out by TÜV SÜD in 2009 on the 15 key tyre sizes for the European market (MICHELIN was first in 13 sizes and second in 2 sizes). Calculated over the average life span for MICHELIN tyres i.e. 28,000 miles (manufacturer source). 2 On average, compared to its main European competitors. 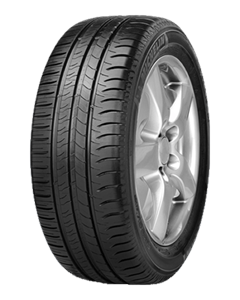 Tests carried out by TÜV SÜD and DEKRA in 2008, 2009 and 2010 on tyre sizes 175/65 R 14 T, 195/65 R 15 H and 205/55 R 16 V, with tyres available on the market at the time. 3 Compared to its predecessor, MICHELIN ENERGYTM E3A Tests carried out by TÜV SÜD Automotive in 2007 on tyre sizes 175/65 R 14 T, 195/65 R 15 H and 205/55 R 16 V.